Wildlife and Habitat Improvement of Nevada is a non-profit sportsmen and conservation organization devoted to the maintenance and betterment of Nevada’s wildlife populations and their habitat. WHIN is a hands-on organization. Many of the members devote countless hours providing the manpower necessary to carry out work projects and to plan and execute the annual banquet and other social activities. WHIN is an organization that your whole family can enjoy and become active in. We encourage everyone to participate. 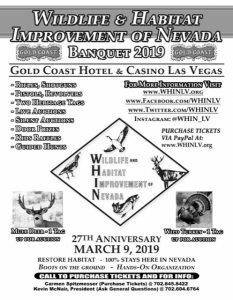 Unlike many other worthwhile groups who work on behalf of wildlife, WHIN is a NEVADA organization, and retains 100% of the money it raises for projects and activities within the state. 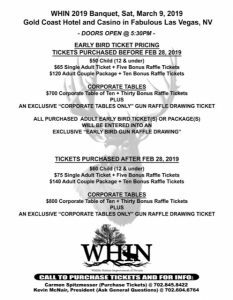 Funds are raised through membership fees, donations, and by auctions and raffles at the Annual Banquet, and other times throughout the year. WHIN officers and workers are all volunteers, and are not paid for their service to the organization, or for the time spent on projects. Funds raised by WHIN are used to purchase materials for field projects, for contributions to government agencies such as the Nevada Department of Wildlife, and for specific purposes such as wildlife research and habitat improvement, or to make donations to, or pool resources with, other non-profit organizations for approved wildlife management projects in Nevada. A newsletter, and other normal operating costs make up the remainder of the organization’s expenses. Copyright © 2011 WHIN. All Rights Reserved.